Enter this unique 5 bedroom home with 4 full baths as you enjoy the view of the beautiful spacious Lanai, pool and spa year round. This home has both a master suite and a guest suite. The elegant dining room will comfortably accommodate a table for your largest guest list. The kitchen flows into an open family room with a view of the pool and spa. The large air conditioned storage work shed can accommodate a car as well, located on this slightly less than an 1/2 acre property. With over 2,330 sq.ft. under air, this home is an amazing value for a large family or looking for those additional bedrooms for family and friends visiting this vacation paradise in South Gulf Cove, with gulf beaches and 5 golf courses only minutes away. 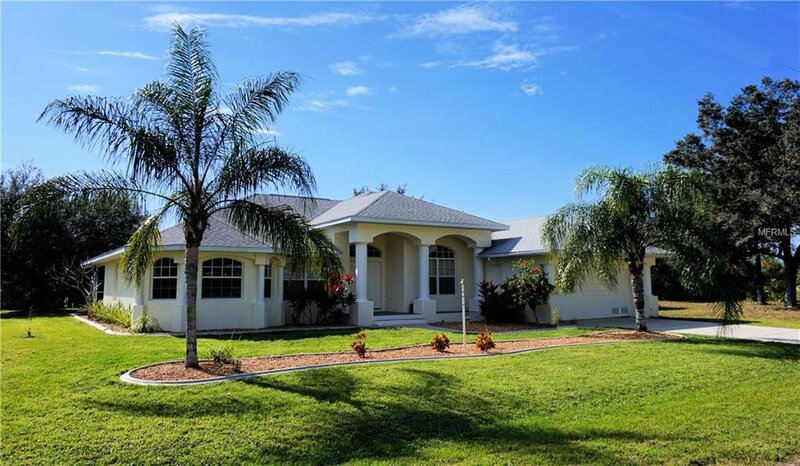 SGC has over 55 miles of navigable canal system leading out to Port Charlotte Harbor with a public boat ramp less than a mile from this property, you will enjoy all that Southwest Florida has to offer! Listing courtesy of COLDWELL BANKER SUNSTAR REALTY. Selling Office: RE/MAX PALM REALTY.